Our local ski shop, Rogue Ski shop, has a great way of getting families into skiing painlessly, both financially and effortlessly. I’m not sure if this system is a common occurrence in other parts of the country, but if you’re lucky enough to be somewhere where there’s a similar program, it’s definitely worth doing. Here’s how it works. Basically, it’s a ski exchange. When kids reach an age, or more exactly a height and weight, they are eligible to join the Rogue ski shop junior ski exchange. It’s simple to get started and doesn’t cost much when you look at everything you get. For around 300 bucks per kid you get three years of ski gear. I’ll walk you through it. When my oldest was 8 we enrolled him in the ski exchange program. 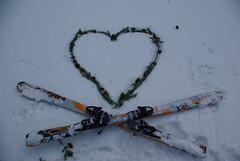 He had been skiing since he was 4 so he was a decent skier, a perfect candidate for the exchange. The ski technicians measured and weighed him then found ski gear( boots, skis and ski poles) that fit him perfectly. That first year he was given a pair of used skis and bindings that had been turned in by a young skier the previous year. Since there weren’t any good ski boot matches, he was given a brand new pair of boots. This gear isn’t chincy or cheap either, good stuff like Rosignol and Volkl. Once he was outfitted the ski techs adjusted the ski bindings to the boots and adjusted the settings that were appropriate to his height, weight and ablility, they even tuned the skis. All I had to do was show up and take the gear home. It was ours to use for the rest of the season. If anything went wrong with the gear (it never did) we were assured that it would be replaced or repaired at no charge. The next year we got a call from the shop in early November asking us to bring in the gear to be evaluated and exchanged out for more appropriate lengths and sizes. Since my son had grown so much over the year, we exchanged our gear and got a second set of boots, skis and poles. Even though the gear had been used, it had only been used a couple of times, it was still in pristine shape. The following year, same thing, only this was the final year of the three-year program. This third set of gear was a little different. This gear we’d get to keep. We wouldn’t turn it back into the exchange program. this year all the gear is brand new. It’s all top of the line, name brand ski gear. The techs made sure to get us dialed with gear that we’d hopefully get more than one season out of. For instance, they put my son into a more aggressive ski, knowing that as he gets better he’ll want the more aggressive style. they also tried to size the skis and boots big to give us some growing room. My oldest is done with the program now. For that 3oo dollars, I got 3 different sets of ski gear, the third set we keep. If I had to buy new skis, boots and poles every year, it would have cost a lot more. It was also a relief to rely on the experts to outfit my son with the perfect gear, set to the perfect settings. There was no guess-work and no fuss. My youngest son is in the ski exchange now and were just as pleased with the results.